She has always been the stand-out sister of the three female Kardahsian siblings. And it was no different today as Kim showed up both Kourteney and Khloe, flaunting her perfect curves in a plum body con dress. The 30-year-old reality star and her sisters were promoting their new clothing line 'Kardashian Kollection' at Sears department store in Cerritos, California, today. While Kim was dressed-to-the-nines in the form-fitting embroidered frock, her sisters went for more casual attire. Kourteney opted for black trousers with leather trim and ankle zipper detail, a white T-shirt with fringe detailing and a black tuxedo jacket. Khloe meanwhile was relaxed jeans, a black sheer top and a fur caplet. All three girls did however wear super high heels; Khloe in over-the-knee Christian Louboutins, Kourteney in a pair of the designer's platform pumps and Kim in T-bone Mary Janes. The Newlywed Kardahsian is clearly benefiting from married life. The brunette beauty was simply glowing from head to toe in her stunning ensemble and her complexion looked as flawless as ever in her pink-hued make-up. She also flaunted her impressive engagement and wedding ring bling and another gigantic knuckleduster on her right hand. But while Kim is clearly happy in her marriage, it appears her sisters are not feeling the same way. Us magazine is reporting Kourtney, 32, and Khloe, 27 , have not taken to Kim's prince Charming. An April trip to Bora Bora with Humphries, 26, things didn't exactly go to plan. NBA star Humphries criticised Kourtney for being a 'slave' to her 21-year-old son Mason and suggested her relationship with Scott Disick, 28 , needed spicing up. The 6ft9 athlete also likes to oaf around with his 5ft2 wife, which irks her siblings. 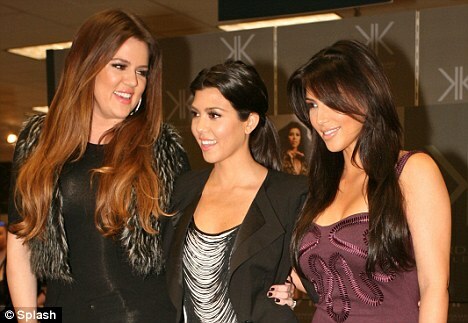 The girls appearance in California comes after Kim and Kourteney's extended stay in New York. Kim, new husband Kris, Kourtney and Scott and son Mason have relocated to New York for a few months to film the second season of their spin-off show Kourtney and Kim Take New York. Khloe, however has remained behind in LA where her husband Lamar Odom plays for the LA Lakers, but has been flying out regulary to visit her family members. The news series is bound to be very different this time round, with newlywed Kim -who was steadfastly single last time round- and Kris setting up home in the presidential penthouse at the Gansevoort Hotel.